What a week this has been! There have been some ups and downs in terms of our search for a house. Lots of hours driving around to look at houses, sign paperwork, work on offers. It's a tiring (and at times heartbreaking) process, but we're trying to enjoy it! I'm more than ready for a weekend. I'm excited to see some of Dan's family and celebrate his grandparents' 50th wedding anniversary. I hope you all have a great weekend as well, and enjoy a peek into what I've been loving this week. As you all probably know by now (at least if you read the paragraph above), Dan and I are in the process of house hunting. I'm one of those people who falls in love with every house that I see and is ready to sign on the dotted line that day, and Dan is NOT. 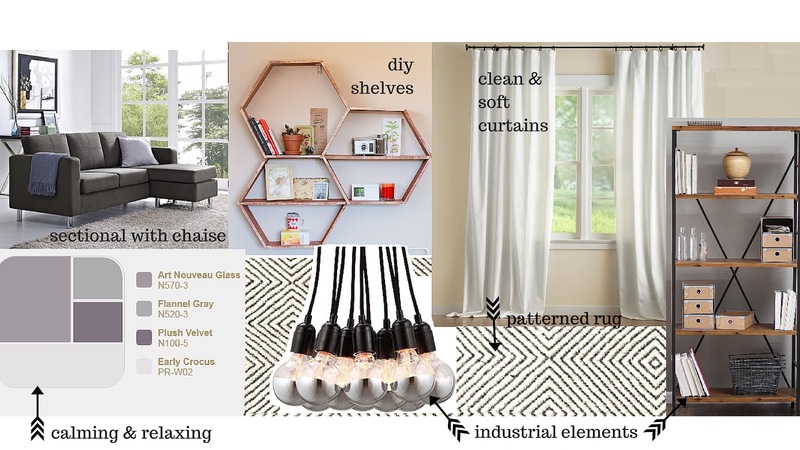 Instead of getting frustrated with the process, I decided to spend my time pinning and looking at interior design blogs for inspiration. I'm also putting together some "vision boards" (how HGTV of me!) and this is one that I came up with for our living room! I love the idea of having a soft, calming color scheme, and Dan and I both love this shade of purple. The main color will be a soft grey, with purple being the "pop of color". I also love industrial elements mixed with soft, romantic fabrics. This week I started to experiment with sauces, and I'm pretty obsessed now. It's amazing how preparing a single sauce can transform regular food into amazing dishes! The favorite one that I've made so far is this super easy sunshine sauce, which I use on everything from plain chicken to kale salad. I also use it as a dip for raw veggies! If your destination is happiness, consumerism is not a through street. P.S.- these guys also have a podcast which I've been checking out! I can't believe that it took me 15 years of running to try out this app! There are so many things I like about it- you can use it without turning on data, it shows you a map of where you're running, can sync up with Spotify, and more. I finally downloaded it because I'm testing out a new piece of running equipment that I can't wait to talk about, and I'm in love! 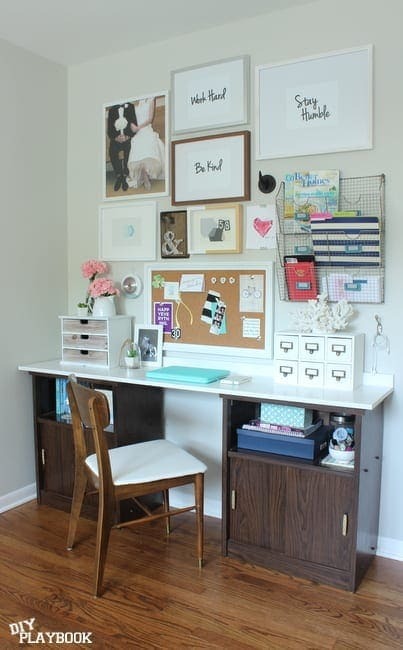 Have any more DIY blog inspiration? We've finally come to the last installment of my annual resolutions and goals! I have quite a bit, but my philosophy for the year is go BIG or go HOME! 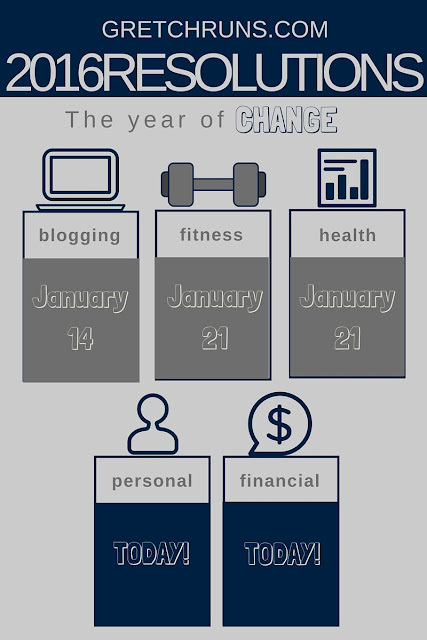 I also have to remind myself that my word of the year is CHANGE, so things might be tough for a while. In the end, it'll all be worth it! For the final part of my goals, I'll be getting more personal. We're going to talk about financial goals and personal goals. I have to warn you that I'm going to be talking about actual financial numbers, so if that topic doesn't interest you or makes you uncomfortable, you might want to skip to the bottom for an exciting announcement. Now, let's get to the goals! 2. Items cannot be requested as gifts nor can I direct anyone to purchase a wardrobe item for me. 3. Gifts and freebies can be accepted and kept. 4. There can be no exchanging of the gift or freebie, unless it is the wrong size or damaged. 5. Hand-me-downs should not be accepted unless they are framed as a gift. 6. All wardrobe items can be repaired, hemmed, dyed, or otherwise altered to provide variety. 8. Should a wardrobe staple such as a white tank top or t-shirt become stained or damaged, it can be replaced. This only goes for necessities. 9. New clothing may be purchased if a situation arises where I cannot get home to access the things in my closet. This only includes extreme predicaments such as: if my luggage gets lost or delayed while traveling or my shirt gets thrown up on while riding the subway to work-- both of which, I sincerely hope, never occur. 10. Borrowing items from other people is permitted. Permanently expanding my wardrobe is not. 11. Necessary running purchases are allowed (new shoes, fuel, race registration, sport massages). I'm allowing myself to buy new clothes for running within reason, while Sokphal is not. 12. I'm putting myself on a freeze for all non-necessities as well (this is broad, but things like new makeup, perfume, jewelry, purchases for the apartment, facials, mani/pedi, etc.) Sokphal is keeping this just a clothing freeze, but I'm going a bit more extreme! 13. If either of us breaks our freeze, we have to buy the other something of their choosing worth $50. Sokphal wants $50 to go towards a new pair of running shoes, and I want a new Energy Bra. Even though six months seems like a long time, both of us are in a position where we don't need more clothes or things. I'm always wanting to get rid of most of my clothes and downsize the things that I have- which I'll talk about below- so having this time line where I can't buy anything is really helpful. I'm in the process of house hunting now, so every penny that I save now counts. I also like the though of having a spending freeze until June so that I don't make any rash decisions as soon as I move in (aka- buy #allthethings from Ikea and Homegoods). This way, I can get all of my stuff in, do some planning, and then see what I actually need! On my Discover card, I get cash back rewards for all of my purchases, and higher cash back for certain categories each month. These are all redeemable on Amazon, so I usually just spend my balance when I buy something on there. This year, I want to save that cash back and see how much I can save up. There's usually a 5% bonus on home improvements stores during the summer months, so this should really add up! I also look at Ebates and Ibotta (affiliate links) the same way. Both are programs that give you money back for purchases you make and submit to the app. I would like to see how much I can make on these two apps throughout the year! I think it will also be interesting to see how quickly the money adds up as the year goes on. Get ready for some graph action! If all of that goes to plan, I should be able to save a large chunk of my income. Dan and I made a budget this year (first time ever and inspired by the Matrimoney Podcast) and came up with a goal of saving $15,000 this year. We have direct deposit on our paychecks, and have money automatically moved to our savings account, so this should be really painless. I also have a personal goal of saving $6,000 in my own account. If I follow my no buy rules and not go crazy after my birthday, this should be relatively easy as well! I'm telling you- making a budget is really life changing! Now, I just have to stick to it! Dan and I both made a rule for ourselves that we wouldn't be going out to eat any more. Since we are both doing the Whole30 (with some exceptions for him), this has been really easy in January. We do have some built-in exclusions for this rule, like for our birthdays or if a friend we rarely see invites us. I have some friends that live all over the country and world, so I wouldn't want to miss a chance to see them! The only downside to this rule is that we're spending a lot more on groceries lately. I've been working hard on meal planning so that we always have enough food on hand, and it's really affecting our grocery bill! If anyone has tips on how to save money at the grocery store (including where to find good coupons) I'm all ears. I actually have a funny story about this. I've been wanting to get a library card for years now, and could never motivate myself to actually go to the library and apply for one. I shared my annual goals on my blog a few weeks ago, and that same day I stopped at the library and picked one up, along with a few books. Gretchen Rubin talks a lot about what tendency people are, and I am through and through an obliger. As soon as I felt outward pressure to achieve something, I went and did it! If anyone else out there is a fellow obliger and needs motivation to do something, I hope that this serves as a lesson for you. Somehow get the outside world involved so that you feel an obligation to fulfill your goal, and it's much easier to actually do it! Where I'm living now, there is a trail that runs by my apartment to the downtown area, which is pedestrian-only and completely flat. I don't take advantage of this nearly enough, and it's a great way to both get in my run and save some money. I currently take the bus to work every day, which is $2.50 each way. If I run commute just one way, once a week from March to June (when the weather is mild) I can save $45. Even though that's not a huge amount of money, it's still money that I'm saving and also helps me get in a run that I won't have to worry about later in the day! My goal is to run more than once a week so I can hopefully save even more. Last year, my goal was only to read 12 books. I was easily reading two books a month for a while, but got lazy since I hit my goal early on. This year, with the help of my library card, I'm hoping to double that number and even exceed my goal of 25! It may be the trendy thing to do right now, but I love the idea of de-cluttering. There are a lot of things that I won't want to move into a new house, so my plan is to get rid of 10 items every month. This seems like a perfectly reasonable amount, so it'll be interesting to see what I'll be getting rid of! Dan and I are both very lazy when it comes to keeping our apartment clean, and that's something that I want to change this year- particularly if we have an entire house to keep clean. We already made a schedule earlier this month, which we've been (loosely) following. This is definitely something that I'm going to have to work on, and I'll share my schedule in the upcoming weeks! I love to cook and challenge myself in the kitchen, so each month I'm going to be giving myself a new challenge. Last year I made a different cuisine each month which was really fun, and I want to do something similar this year. For January, my challenge is completing the Whole30, which really pushed my out of my comfort zone as far as prep and cooking! And now on to exciting news- Kristen and I are starting a link-up that we're calling "What's New With You?" You know when you haven't seen a friend for a long time, and run into them at the store, the first thing you say is "so, what's new with you?" That's the idea behind the linkup- sharing what's going on in your life, what new things you're up to, what you're loving, anything! -Any type of post is allowed- share your favorite post of the month, or a post saying what you're up to! This is a great chance to share those Currently posts, or monthly goals, or highlights from the month. You have complete freedom! -Not mandatory, but it's always fun to check out the other blogs on the linkup and share the love! 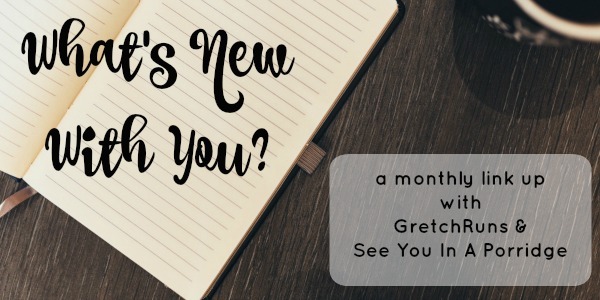 Maybe you'll even find a new blogging buddy who will want to ask you, "so, what's new with you?" That's it! I hope that you'll all join in next Thursday. I also want to send out a huge shout-out and thank you to Gina for this suggestion! When she saw my post on my blogging goals, she immediately messaged me and suggested getting together with Kristen to do a link-up. She's been like the fairy godmother of blogging for me- always there to help me out and give me suggestions on growing my blog (and my closet). Thank you, Gina, and please go check out her blog if you haven't! Any tips for saving money at the grocery store? Does anyone else want to join the spending freeze? I've been meaning to do a What I Ate Wednesday post during my Whole30 to show you all what I eat in a day. I've been getting a lot of questions about what all you can eat and if the food is actually good (a lot, and YES). What better way to give you a closer look at the program than a peak into what I had to eat for an entire day? The day that I'm sharing is from Sunday, when I did my long run of 13 miles. Here's what I had! Before going for a run, I never used to have any breakfast. Everything seemed to upset my stomach, so I would usually grab a piece of fruit before heading out. In fact, before my half marathon PR, all I had was an apple and a few bites of a honey stinger waffle so I wouldn't get cramps! After some experimentation, I've found some foods that don't upset my stomach and keep me energetic and fueled the entire run. This is a typical breakfast for me now and it's perfect! It's about a half hour drive to the park where I went running, so on the way I had a pouch of unsweetened apple sauce. Even though these are marketed for little kids, I love them! They're easy to grab and eat on the go, and they taste really good. During my run, I had a piece of date each mile. Cutting them in smaller pieces helped me digest them a lot easier. I also stopped for water at mile 7 when I passed my car, and had some coconut water after I finished. I'm never hungry after runs, so after I got home I took a shower first, then made myself eat something. I had a leftover kale salad from dinner the night before, and added in some chicken drumsticks. I just pulled off all the meat and cut it in small pieces, then added it to the salad. It was really good! I also had a glass of tart cherry juice, which helps reduce muscle soreness. I was hungry a few hours later, so I snacked on some of the homemade Lara Bar bites that I made. I also met up with Alexa for some tea at Big Dog Coffee in the South Side. We both had a turmeric tea which is delicious and perfect for a chilly winter day. I loved the vibe of the coffee shop and would definitely go back there again! For dinner, I made Margaret's Crock Pot Taco Soup. I had it simmering all day long, so it tasted amazing, and was super easy to make! I loved how chunky the soup was, and it really filled me up and kept me warm. This recipe is definitely a keeper- even Dan liked it! With dinner, I made a blood orange Paloma (juice of one blood orange, lime juice, and sparkling water) which was refreshing and delicious, and watched some football. Dan had a hockey game late at night, so I made a quick snack before we left. I was preparing some sunshine sauce for the following week, and used some leftover sunflower seed butter and dates for a snack. It was really good and had a different taste and texture than the almond butter that I usually use! What are some snacks you've been enjoying lately? Who else loves crock pot meals? What do you usually use to fuel long runs? Hi everyone! Today I'm so excited to share my first recipe on GretchRuns. I know that I promised a recipe for egg cups, but I'm still working on that and just had to share this easy and delicious snack. The eggs will be coming next week, swear! This one is so great that I just couldn't hold off on sharing! I've been loving Lara Bars during the Whole30 for a quick snack, but they're pretty expensive for having such a simple ingredient list. I played around with some recipes that I found online and experimented with my own flavors, and made my own! I decided to make them into balls, because I think they're more fun that way and easier to grab and go. Today I'll be sharing two varieties, but I'm working on developing more since these are so fun to experiment with! Blend cashews until they are in small pieces, but still have a bit of texture. 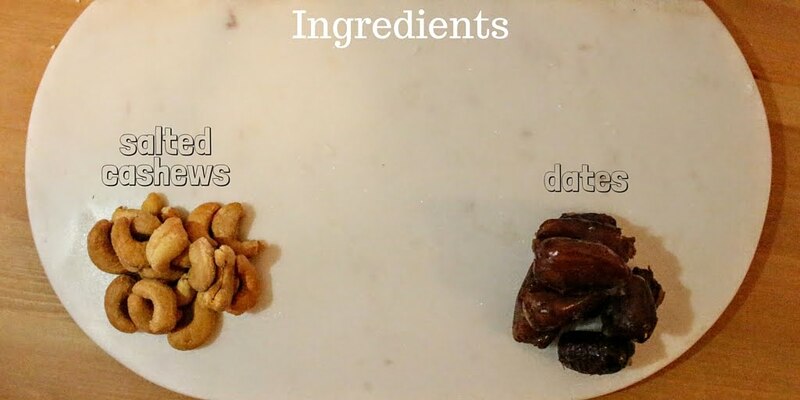 If you're using unsalted cashews, throw in a dash of salt. Add to bowl. Mix these two into a paste, and roll into balls. For my recipe, I used a half cup of both cashews and dates, and ended up with six large balls, or 12 bite-sized balls. It's easy to adjust the amounts to make more or less, and it only takes about 3 minutes from start to finish! I also have a bonus recipe that I like to call "A Bite of the Tropics". It's so cold and dreary out lately, but eating these tropical flavors transports me to a warm and sunny place. I love these! Blend dates, juice and zest until they are a thick paste, and move to a bowl. Blend cashews and coconut until they are in small pieces, but still have a bit of texture. 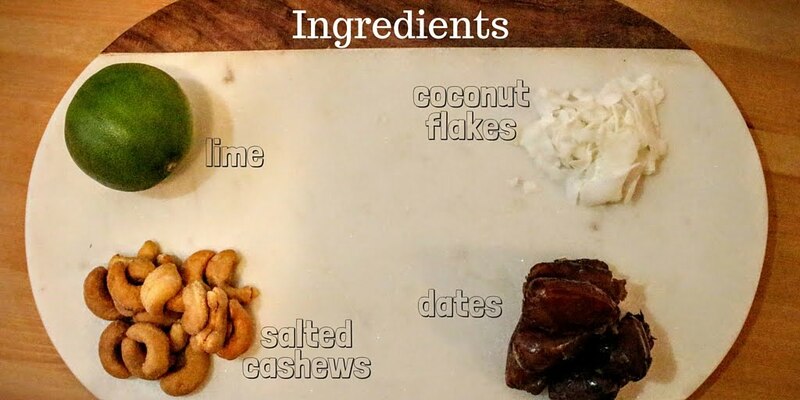 If you're using unsalted cashews, throw in a dash of salt. Add to bowl. This recipe is also easy to adjust to make more balls. Make sure you add more lime so that flavor really comes through! If you're not as much of a fan of lime, you don't have to add the juice. I love how the zest adds a bit of green color, and the coconut is very subtle but delicious. These are so refreshing! What's your favorite on-the-go snack? Do you have any favorite flavor combos? Who else loves Lara Bars?? linking up with: Meatless Monday with Sarah and Deborah, Meatless Monday with Annmarie, Delicious Dish Tuesday, What’s Cookin’ Wednesday, Full Plate Thursday with Miz Helen, FoodFriDIY, Foodie Friday, and the Weekend Potluck. Another week of training has come and gone, and I keep feeling stronger and stronger. This week we were hit with a bit of the blizzard, but luckily I was able to get outdoors for most of my runs. I'm hoping this week will be a bit more mild (and maybe even be able to meet with the True Runner marathon training group for the first time! ), but overall I was really pleased with my week of training! This was a very, very cold run! I bundled up like crazy and was still freezing. I will gladly take cold weather on my short, easy runs over a cold 15 miler, so I didn't mind it too much. I ended the run with 4 strides going down a side street by my apartment which is about 100m long. The stretches felt great, and I can feel my balance and flexibility improving! Once again, marathon training track practice was cancelled due to weather. I had to go to the gym again to get in my speed work, which ended up being a great workout. On my schedule was 1 mile warmup, then 2 miles at tempo (8:15) and 2 mile cool down. The pace felt challenging but not too hard for me, so for the second tempo mile I bumped up the pace to 8:00. Overall, a great run! Luckily, this week was a bit less challenging than last week. I was only sore for about 2 days as opposed to 4, so that's good! I also remembered to bring water with me to class, which made a huge difference. PSA- don't workout without water! Hydration is important! I was lucky to get out of work a bit early, and went for a run as soon as I got home. I knew that the snow would start to come down in the early afternoon, and I was happy to only get some on the second half of my run. The weather was cold but wasn't too windy, and this was a really nice run. I went in a completely different area than I usually run, which was a great change of pace! Thanks to the winter storm, all of the roads and sidewalks around me were a complete mess! I wanted to be safe, so I stayed indoors to run. Instead of running on the treadmill again, I ran on the indoor track. It's a very small track- 15 laps for a mile- so I only did 3.5 miles while listening to some podcasts. Not the most fun or interesting run, but I got it done! After running, I wanted to do some spinning as well. My legs were feeling tight, so I went on a nice and easy ride on the bike. I love going on the Espresso machines that have different courses for you to watch as you ride! I went on a California coast ride, and it made me forget about the snow for a bit. I went for my long run at North Park again. I did a total of two laps around the lake, with an added 3 miles by looping around McKinney and Kummer. This is a hill that I'll have to tackle during Just A Short Run, so it was nice to add it to my workout! It was really cold out, but luckily no snow and little wind. I started out feeling sore and not great, but seemed to loosen up and feel better as the run went on. I kept up with my fueling plan of eating dates- having about 1/6 of a date every mile. This didn't bother my stomach at all! I also stopped at my car for a drink of water at about mile 7.5. I ended the run really strongly, with mile 11 being 9:05 and mile 12 9:03. It's crazy to me that during my long runs I seem to hit my stride and feel stronger during the second half. In the past, I would always fall apart at around mile 7, so this is a fantastic start! How was the weather in your town this weekend? I apologize if anyone saw this posted last night. I had the wrong time scheduled, so you might have seen this post half-finished! Whoops! 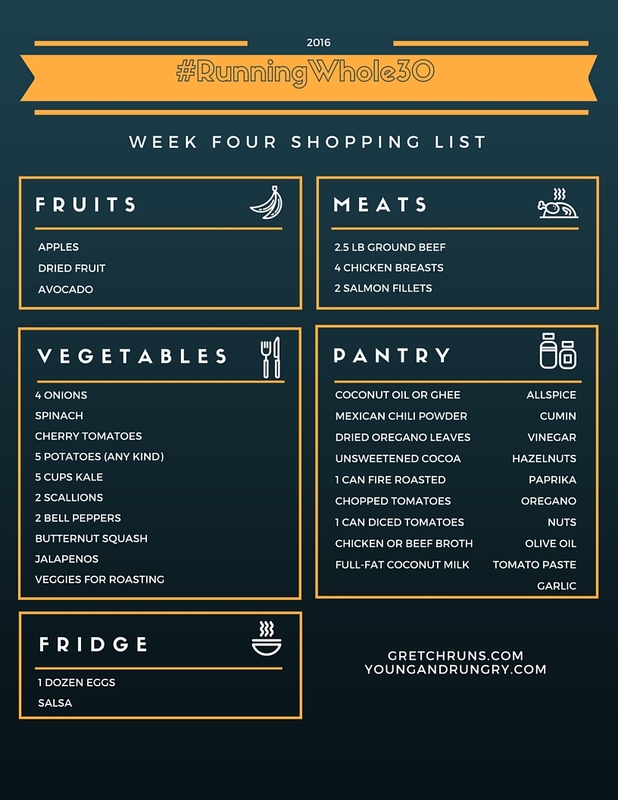 I can barely believe it, but this is my final week of planning for the Whole30! I thought that by this point I would be counting down the hours until day 31, and planning out my first non-compliant meal. To be honest, I see no point in changing my eating habits right away. I'm happy where I am and eating so much great food, and my training hasn't suffered one bit. I'll talk more about my transition plan next week! I guess it goes without saying that week three was another success for me. I did wake up a bit more tired than usual, but that's due to staying up late to watch Australian Open matches every night! Other than that, my energy levels have been really high all day long, and I've been feeling great during my workouts. I also noticed that I haven't been feeling sick or had any stomach issues at all this month. It seems like everyone at work is sick lately, but I haven't had as much as a headache or cough. My surprising change for the week is that my eyes are getting lighter! This is something that I noticed but thought was my imagination, then Dan mentioned that my eyes were looking brighter than normal. I compared two pictures of my eyes- Day 1 on top and Day 20 on bottom- to show you the difference. It looks like the outer edge of my iris isn't as dark anymore. It also looks like the actual white of my eye is a bit less vein-y, and my under eyes are also lighter! What do you think- am I crazy or is there a difference? I love the idea of having egg cups for an easy grab-and-go breakfast. Each cup can have its own ingredients, and I'll be sharing my recipe for this on Tuesday! I'll also be trying out Michele's breakfast idea, which looked amazing on her blog. Most of the meals that I'm making this week make a lot of food, so I'll be relying on leftovers for my lunches. I might also make some shredded chicken and add some veggies for a quick and easy lunch in case I run out, but I'm hoping I have enough food to carry me through lunch this week! I'm so excited for my dinners this week. One of my favorite simple meals to make is fish with roasted veggies, so I'll be making that two days this week. The rest of the days I'm going to be feasting on a chili recipe that has been suggested to me so many times, and Margaret's amazing looking soup. I love how simple prep will be for both of these recipes! I've been doing pretty well about the no snacking rule, but I typically have something to eat before or after my workouts. I loved getting Lara bars last week, but this week I'm going to try to make my own. I've also loved having a protein-packed smoothie before my workouts, or some unsweetened apple sauce. 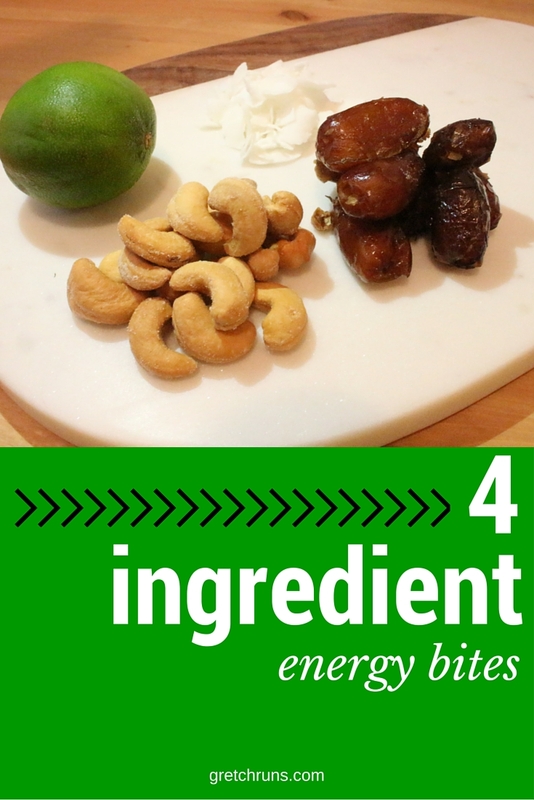 Quick and easy fuel that's been great for my runs! Happy Friday everyone! I don't know about you, but I'm ready for the weekend. For some reason, if I have a four-day week, I always seem so much busier both at work and at home. It's almost like I need to cram that day off into the rest of the week. I hope that everyone stays safe this weekend! There's a huge snow storm in the forecast all over the place, so please be careful out there. I love what Dorothy said on Instagram- "One missed run WILL NOT RUIN a race or your training, but one run can certainly RUIN a race if you fall or get injured." I mentioned before that I've been loving to drink some La Croix water while I'm on the Whole30. Since added sugars and alcohol are out, I've been relying on it to get a fizzy fix, and for a break from all the water! Unfortunately, it's pretty expensive, and I find the taste a bit too mellow for my liking. This week, I decided to try out Deer Park Sparkling Water since it's less than $1.00 for a bottle, and I'm hooked! It has a much stronger taste than La Croix, and it's delicious. I'm not sure how they can pack so much flavor in a sparkling water with no added sugar or artificial flavors, but I'm obsessed. My favorite flavor is watermelon lime! If you'll all remember, I'm a huge tennis fan, even though I'm awful at playing it! I love to watch all of the tournaments, but the grand slams are the most exciting. The first one of 2016 just started this week in Australia, and I've been watching as much as possible. The time change is a bit difficult, but I can watch a few matches at night and then the final match when I wake up. The first two rounds have been really exciting to watch, with lots of upsets early on. So far, I'm rooting for Victoria Azarenka and Johanna Konta on the women's side, and Nick Kyrgios and Roger Federer on the men's side! On my day off Monday, my mom and I went out shopping to try to find my wedding dress after numerous failed attempts at online shopping. It only took us about an hour, and I found my dream dress! My vision was something that flowed in the wind and was drapey but still flattering. I also wanted something a bit different and not the typical beach wedding dress, and I think I found it! We stopped at lots of stores in the mall, and made our final stop at Express. Waiting in the entrance of the store was a rack of white maxi dresses, and I knew right away that this was the dress. I love how it looks on, and I like that it's simple but still has some interesting details. I'm deciding if I want to replace the gold chain straps, but for now I'm in love! This week was all about the shows on HGTV. I'm still house hunting (going to see 7 more tomorrow! ), so I'm trying to learn some techniques for what to look for and get inspired to start DIYing! I haven't watched any TV this week other than the Australian Open and house shows, so you KNOW I'm obsessed! Luckily, Dan is just as into them as I am, so we watch the shows together every night and pick out what we like and don't like. 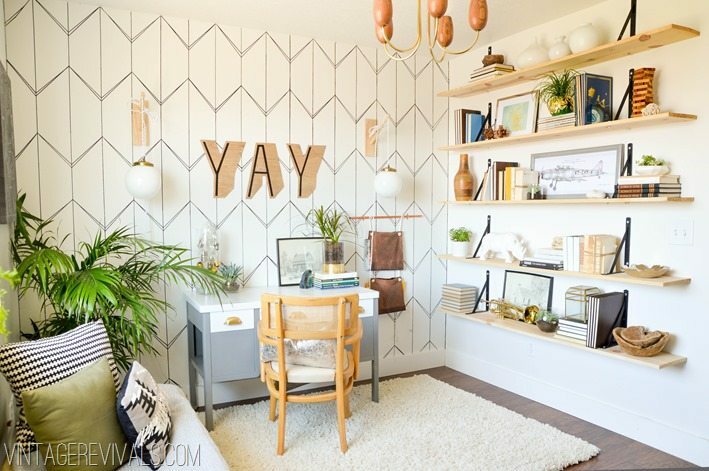 Some of my favorite shows are: Fixer Upper (p.s.- here's how to get that Fixer Upper look in your house! ), House Hunters, and Buying and Selling. What's your favorite? These are the songs that are currently on repeat in my running playlist! Is anyone excited for a potential snow storm? What shows are you loving right now? Happy Thursday! 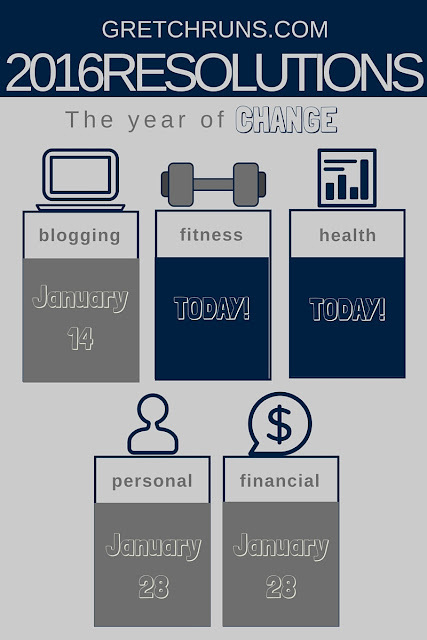 Today I'll be sharing part two of my yearly goals. Today it's all about fitness and health. This is probably the group that is the scariest to me, and has the most ambitious goals. Some of these goals I made specifically to challenge myself and get out of my comfort zone, so I'm both nervous and excited to work on these. I hope you enjoy reading about my goals, and be sure to share yours in the comments! After some trial and error last year, I've come to realize that my body does best between 25 and 35 miles a week. Last year I had the goal of hitting 1,000 miles (which I barely missed). With training for at least one full marathon this year, I know that I can easily hit that number, so my goal is to do 1,200 miles. That's an average of 100 miles each month, which is definitely doable for me. I set a lot of PR's last year thanks to consistent training, and I know that I can take even more time off! I'm running a full marathon in April, and I should (hopefully) be able to take time off of my current PR of 4:38:12. I raced my PR marathon with minimal training when I was in college, so I'm hoping I can take off some serious time! Here are some of my goals for the year. Some of these are going to be difficult to reach, but I think with enough hard work I should be able to achieve them! I love the saying "Reach for the moon. Even if you miss, you'll land among the stars." Even though some of these goals seem overly ambitious, I'm going to put my all into training and trying to reach them. This number freaked out a lot of people! 20 races seems like a lot to run. However, I like to use races as training runs for longer distances and treat them as a long speed workout. I already have a few races planned for my full marathon training, and want to work on my speed in the summer by doing some 5ks. I'm also one of those runners who need to be training for something to stay out there. I wish that I could motivate myself to run without a plan or a goal, but I know myself and know that this is how I work the best. This might not work for everyone, but it does for me! With that in mind, I think that 20 races is definitely attainable but will take some work to get there. Right now, I'm only able to swim about 100 yards non-stop. I really want to work on my endurance this year, and I think that 1,000 yards would be a great goal for me. Right now that seems almost impossible, but I know that if I stay consistent I will be able to do it. My plan is to start swimming twice a week. Lately I've been going once a week, so I think that the extra day of being in the pool will really help build that endurance. When I'm at the pool, I also like to spend time in the sauna and hot tub. That always seems to help loosen up my muscles, so I think adding this to my training plan will also benefit my running. This year, in general, I just want to be more active in the summer. I started to bike ride last year, so this year I'm hoping to get in some longer rides. There are so many amazing trails around Pittsburgh that are perfect for biking, so I want to explore them. My big goal is to bike part of the GAP, which runs from Pittsburgh to DC. For now, I think 20 miles is a good stepping stone to eventually bike longer distances. I love to try new fitness classes, but I get anxious when I try new things. In the past year, I've been pushing myself to get over this by making goals to do new things that are scary for me- I joined the running club at True Runner, started to bike ride and swim, and took new classes at the gym. There are still a few more classes at my gym that I haven't tried out, and my goal is to try out four classes throughout the year. I'm excited to see what I can try out, and of course I'll share all of that here! I'm embarrassed to say when my last check up at the doctor was. This is something else that I'm nervous to do, even though I know that I really should. At work, we get wellness incentives for doing things like getting an annual checkup, going to the dentist, getting our eyes checked, and more, so I'm literally losing money by not going to the doctors. This year, it's my goal to get an annual checkup (and to find a doctor), go to the dentist (appointment is scheduled), get my eyes checked, and go to the dermatologist. I'm already off to a great start on this goal! I've been doing the Whole30 this month, which is inspiring me to keep my habits clean. So far this year, I haven't had any alcohol, added sugars, snacks, or sugary drinks. I hope to continue that for the entire year (minus the occasional glass of wine or draft). I'll talk more about my eating and cooking goals next week, but I have some ideas on how to maintain my healthy eating habits. I talked more in-depth about this in my post on Tuesday, but I added three supplements to my diet: Fish Oil, Vitamin D3 and Calcium. When I go to the doctors I'll find out if I need to add any other pills to my diet. For now, I think these three are a great start! What are your health and fitness goals for the year? Does anyone else put off going to the doctors? How many miles do you want to run this year? Oh man, do I love Etsy! I could waste hours just going through all the different products that are available. I also get inspired by the products that are offered or the art that is available. I always think to myself, "Hey- I could do that!" Throughout the years, I've bought my fair share of items off of Etsy. Some are items that are unique and I would definitely recommend, which I'll be sharing today, and others were complete misses. I'll also be sharing some things that are on my wish list, which I think is even more fun! I hope you enjoy, and maybe even find something to add to your wish list! I've been talking a lot about my planner lately, and I'm in love with it. This is actually my second year in a row getting one from Plum Paper Designs, and they made some improvements in this version. Instead of having a frosty page covering up the planner cover, it's a new material that is water and tear resistant. It gives the planner a much more professional and clean look. I also love the fact that for every month, there are a few blank pages to take notes, as well as a goal page- where I list out my goals for the month along with important events. The layout that I chose has three sections for each day. They're labeled Morning, Afternoon, and Evening, but I use them differently. Morning is where I list my exercises for the day, based on my marathon training plan. Afternoon is where I list any activities for the day or things I need to remember to do. Evening is where I have my meal plan. 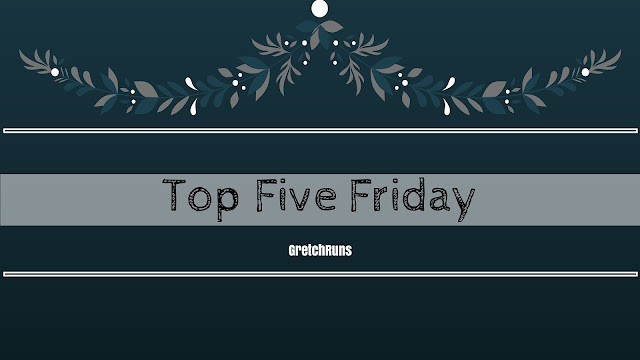 There's also a check list at the bottom of each day where I list my blog post for the day. I also purchased a My Bills page. There are a few different additional pages that you can add to your planner that will be added to every month, like a monthly cleaning chart, to do lists, and even blog planning! I liked the idea of the bill tracker so that I could track my expenses and make sure that my budget is on track! Overall, I'm really happy with my planner. The shipping takes a bit of time, but I love the fact that you can get it customized with your pattern and name on it. There are so many cute designs in the shop, and different planner options to choose from. I got the regular planner, but there are also specific ones for families, teachers, weddings, fitness, and more. David DiCello is a great Pittsburgh photographer, and I love following his instagram account. He gets the most beautiful pictures of the skyline during sun rise, and has some seriously epic fireworks photos as well. My dad is a huge fan and is actually the person who introduced me to his work, so I knew a calendar with his photos would be a great Christmas gift. In David's shop, he has a ton of photographs available to purchase, as well as a calendar. It's great quality and all of the pictures are gorgeous! I love this little world watercolor print! I have it hanging in my cube, and it reminds me of the trips that I've gone on. 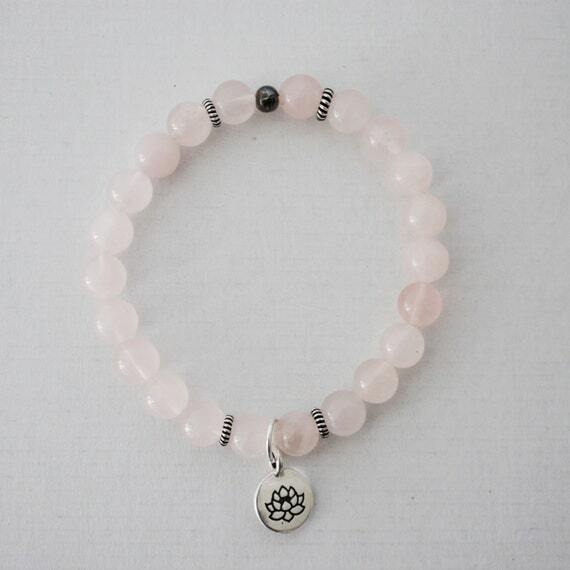 There are lots of different sizes and colors available from this shop, as well as specific countries. I could see myself getting a large print for my future office! Now let's move on to some of my wish list items! I had to plug Pelistones, because it's the business of a fellow Bloggers Gonna Blog girl! I love her bracelets so much, and there's such a strong message behind each one. If you're interested in learning more about Lindsey, check out her interview on Georgie's blog! One thing that I really love about Etsy is that you can find absolutely ANYTHING. I wanted to find something delicate and nature-inspired for my wedding hair, and I found so many beautiful options! 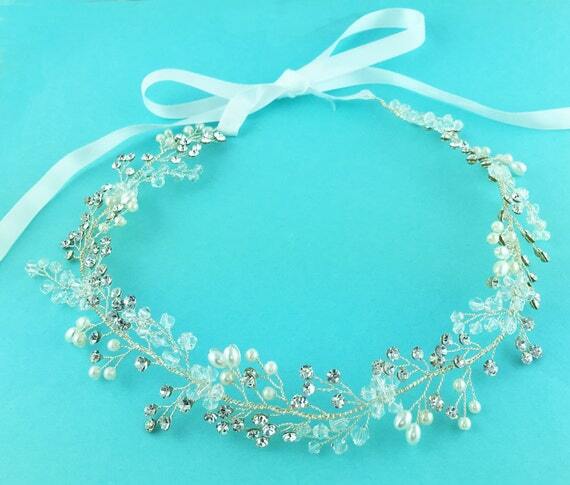 I love how this particular one mixes pearl, clear beads, and rhinestones. 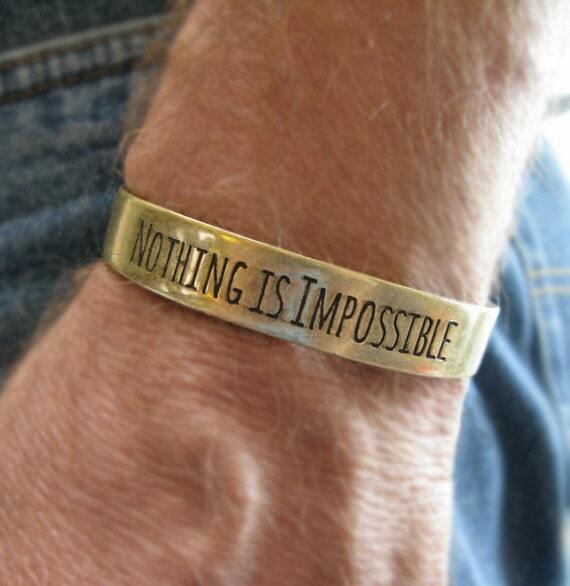 Not only do I love this as a stand-alone bracelet, but its a cover for a FitBit! I think it's so cool that there are designs out there specifically made for the FitBit. The covers that are available at stores are kind of boring and ugly, or super expensive. This one is affordable and has a great message. There are so many unique home items on Etsy. I love how you can really find a one-of-a-kind item for a great price! I think that all of the planters in this shop are really interesting. 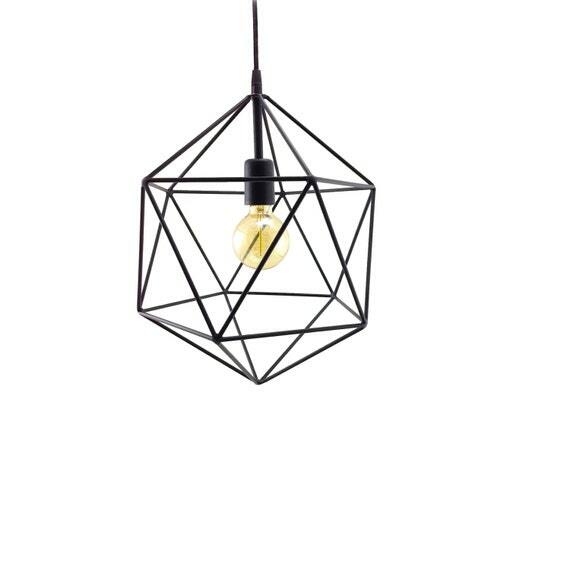 As you'll see below, I'm really into the geometric aesthetic! There are also really unique light fixtures. 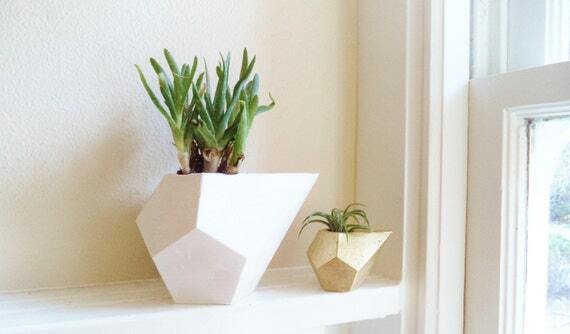 I just know that when I get a house, I'm going to be decking it out in lots of Etsy finds! 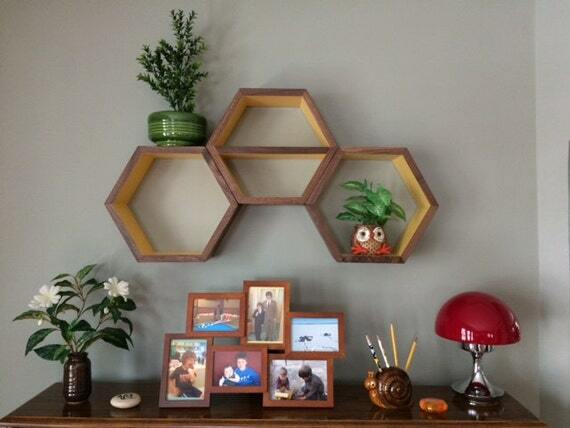 How cool are these honeycomb shelves? I saw a similar DIY on A Beautiful Mess that I might try out, but it's good to know that I can buy some if they don't end up working out! 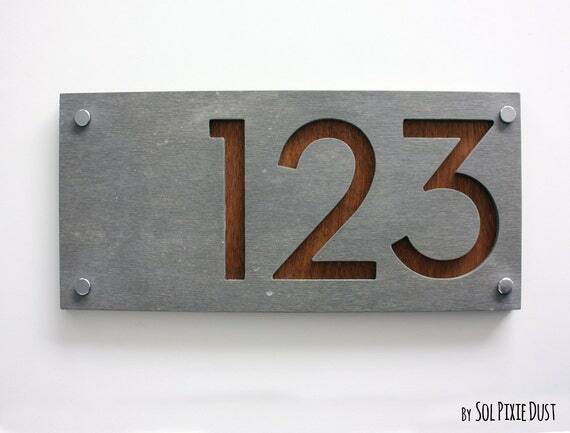 How cool would it be to have a unique house number? There were SO many options online, but I love how this one mixes industrial with nature. That's one of my favorite styles! 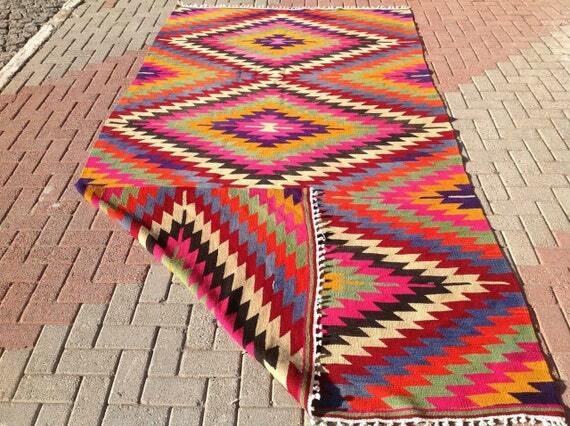 Rugs can be pricey, but I found some really unique and beautiful ones on Etsy. I love how vibrant the colors are, and the pattern is edgy yet classic. I think this would look great in a study, or to jazz up a living room! Are you an Etsy lover as well? Have you made any recent purchases on Etsy? Who else is a planner? What kind do you have? For today's post, I wanted to do another question and answer session on Whole 30. I had a lot of fun putting together last week's post, and a lot of you found it helpful, so today I wanted to answer some more questions! How can you eat out during the Whole30? Sometimes, though, things come up and you have to go out. This doesn't mean that your Whole30 is sabotaged, there are just some steps you need to take to be prepared! - Find out where you're going (or pick the restaurant if no one else has decided!) and check out the menu. Look for any special menus, like gluten and dairy free, for items that would work. Luckily, this is becoming normal and most chain restaurants have accommodating menus or items! - As far as food goes- pick similar food to what you're cooking. Chicken, steak, fish and salads are all great options. Make sure that any side dishes are also compliant, which means no potato chips or fries! - When ordering, don't be afraid to ask about preparation methods (no cooking in butter or vegetable oil!) and "hidden ingredients" like croutons and cheese. For veggies, get them steamed, grilled, baked or raw. For potatoes, get them without sour cream and butter. - For drinks, remember to not order alcohol or sugary drinks. Plain water is the safest (and cheapest) option, but you can also get sparkling water with lime if everyone else is drinking. Some restaurants even have "mocktails". Check the ingredients, and make sure there's no sugar added! - The book The Whole30 makes a point to never cry wolf and claim you have an allergy when ordering if you don't. The restaurant may become jaded by the number of people claiming to have allergies. Of course, this is all personal preference. Some people don't like to take pills and would choose to skip adding supplements to their diet. The best idea is to check with your doctor and see what would be the most beneficial to you! How sustainable is it in the long run? The main complaint or criticism that I hear about Whole30 is that it isn't a life-long, sustainable diet. That's true- it's a very time consuming process to plan out your meals, you're pretty much cut-off from most social activities, and you're cutting out food groups that are extremely prevalent in most products. I can't even tell you how long it takes me to shop now, because sugar is added to EVERYTHING! However, this program is not meant to be a long-term "diet". It has the number 30 in the name for a reason- you're only supposed to stick with it for 30 days, then introduce food groups back to your diet to see which ones adversely affect you. A lot of people who have had successes during the program have gone on to adopt similar eating habits in their life, with adding in a group here or there. Margaret is a great example of this- she shares mostly Whole30 or Paleo recipes on her blog year round! 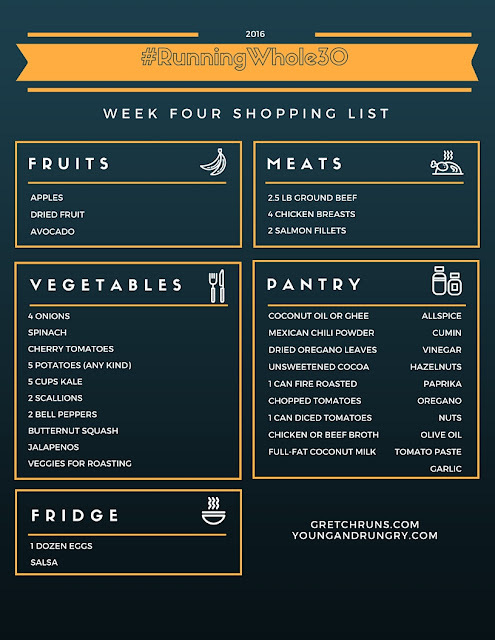 I mentioned in my update on Saturday that I'm feeling really great from this experience so far, and I'm thinking of sticking to these eating habits in the long term. I'm definitely going to test out different groups and see what bothers me (really hoping that alcohol will be ok! ), but I've seen such a tremendous improvement in my health and fitness, that I don't think I could ever go back to my old eating habits. 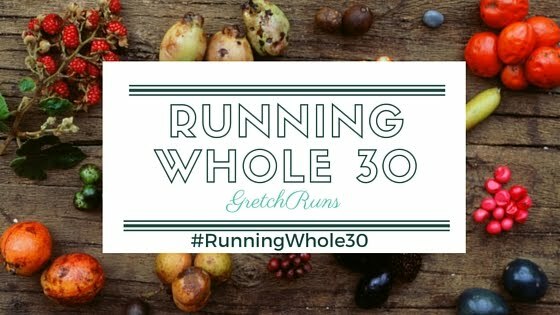 What other questions do you have about Whole30? Has anyone ever gone through this before? What was your experience AFTER the 30 days? Who else has tricks for eating at restaurants?